In this lesson we’re going to tackle a basic question about the major scale. I often get this from new students and although it seems simple, it’s a good one. Understanding how many and why gives us a foundation to progress into the next music theory topics. So how many major scales are there and why? In total, there are 12 major scales because the major scale pattern can begin on any of the 12 notes of the musical alphabet. What’s really interesting is that some major scales can be spelled out using either sharps or flats even though they would sound the same. So although we can have a major scale on any of our 12 notes, we have more than 12 ways to write them out. How do Major Scales Work? Why do Some Major Scales have Sharps and Others have Flats? What’s the Point of Scales, Anyway? Every scale you’ll ever meet is a specific pattern of intervals (and an interval is the term for the distance between any two musical notes – from the smallest step to the largest range). Like most scales, the major scale pattern works with half steps (or ‘semitones’) and whole steps (or ‘tones’). Half steps and whole steps are the two smallest intervals of the traditional musical alphabet. In case this is new to you, here’s a brief explanation of what half steps and whole steps are. The half step is the distance between any one key to the next. It doesn’t matter whether the next key is up, down, black or white – notes that are immediately next to each other are a half step away. Even though we use the piano to illustrate, it applies to all instruments. The whole step is equivalent to 2 half steps. That means that a whole step is the distance between any two keys that have another intervening key in between. To get a whole step from any starting note, simply skip a key and the next note is a whole step away. As we’ve said, whole steps and half steps are the building blocks of scales. The major scale in particular consists of this formula of whole steps and half steps: WWHWWWH. That means: two whole steps, a half step, three whole steps, a half step. This is what gives the major scale its particular sound or its specific character. Here it is starting on the note C.
From B to C is a half step. This gives us the major scale, consisting of 7 different notes laid out with the pattern WWHWWWH. Notice that for this to work we begin and end on the same note. Another way of writing the ‘WWHWWWH’ formula is ‘TTSTTTS’ where ‘T’ = ‘tone’ and ‘S’ = ‘semitone’. Tone and semitone are other terms for whole step and half step. Which set of terms is used depends on the country you study in. To learn this formula simply memorize where the two semitones/half steps go. In the major scale pattern, there is a semitone between the 3rd and 4th degrees and the another semitone between the 7th and 1st degree. The rest are all tones/whole steps. The major scale pattern works just the same way if it starts on any other note. Since we have 12 different notes in the musical alphabet and the major scale can start on any of them, we get 12 major scales. What’s very important is that the pattern of whole steps and half steps is always maintained. As we said, this is what gives the major scale its distinct character – changing the pattern would result in an entirely new scale. So what do we do to make sure that the WWHWWWH formula is the same no matter which note we start on? We use sharps and flats! As you’ll see below, for example, the G major scale requires that the F is sharpened. This ensures that the last interval is a half step (F sharp to G) rather than a whole step (F to G). Or, for example, in F major we must flatten the note B to ensure that we get a half step between the third and fourth notes (A to B flat) rather than a whole step (A to B natural). 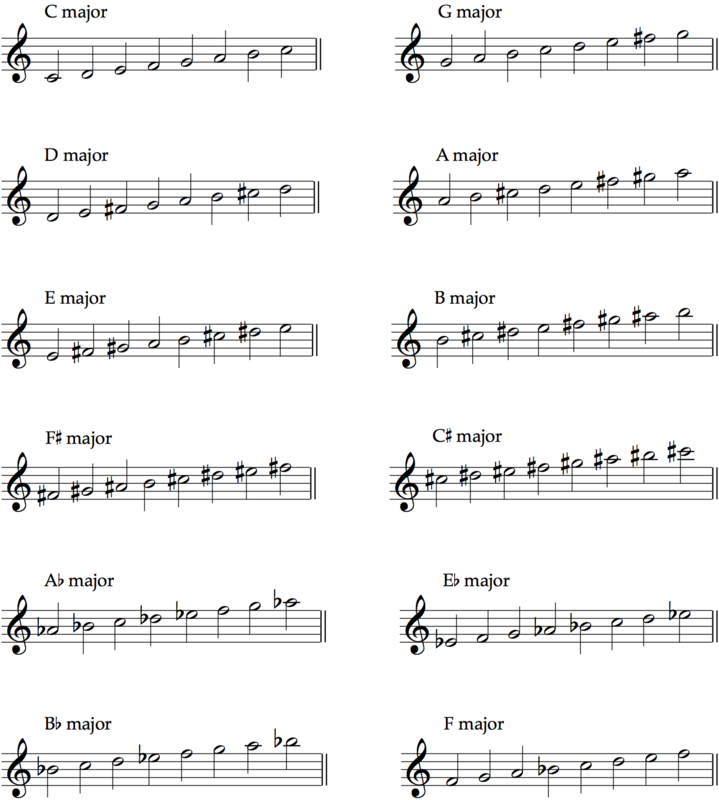 Here are all 12 major scales with their proper sharps and flats. The reason that some major scales have sharps and others have flats is to avoid overly complicated notation. Let’s take the scale of A flat major for example. We can rewrite the starting note A flat as G sharp because these are ‘enharmonic equivalents’, meaning that they are different spellings for the same sound. All this can be avoided if we simply rewrite the whole scale. Instead of G sharp major we can have the simpler A flat major (as we saw in the picture above). All the notes are the same – they’re just spelled differently. It’s much easier to read a scale with 4 flats than a scale with 6 sharps and 1 double sharp. While A flat major is normally preferred to G sharp major, there are a handful of other major scales that can be rewritten without much difficulty. These major scales can be spelled with either sharps or flats depending on the context. ‘Context’ could mean anything from the overall key in use to the instruments or musicians playing. F sharp major and G flat major are enharmonic equivalent major scales. They sound the same but are spelled differently. C sharp major and D flat major are enharmonic equivalent major scales. They sound the same but are spelled differently. C flat major and B major are also enharmonic equivalent major scales. For instrumentalists scales are an opportunity to practice deeply. They allow us to practice very specific techniques and articulations without all the difficulty and the nuances that music from the repertoire demands. If you can play a scale on the piano beautifully, imagine what you’d be able to do with a piece by Chopin! For composers, the notes of a scale and especially the intervals between them give endless and unique possibilities for creating mood and character in music. Want to create a simple catchy tune? Use simpler intervals or fewer notes. Want to create excitement and build tension? Change the scale. Want a weird or curious effect? Grab a note outside of the scale. By picking and choosing which sets of notes we work with, the possibilities are endless! In this sense it’s very much like painting. Instead of a landscape or a portrait we have a song or a piano piece and instead of colors we have notes. The scale is our colors laid out nicely in front of us. C major transformed into C minor by flattening degrees 3 and 6. What should I learn next? Once you know how the major scales work from this lesson and why there are 3 minor scale forms, go to this lesson to learn how to identify between major and minor music.